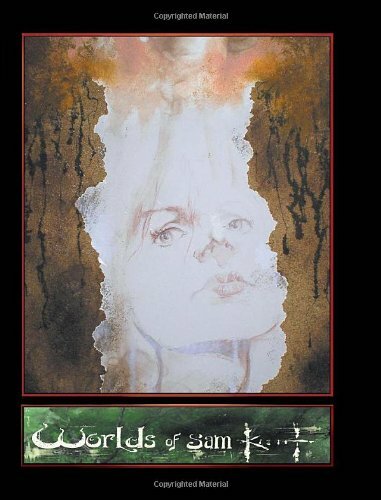 The Worlds of Sam Kieth is the autobiography artbook of American comic book writer and illustrator Sam Kieth. He's more known as the creator of The Maxx, Zero Girl, and My Inner Bimbo. This artbook isn't about his commercial works, although there are some but those are not the focus. It's more like a sketchbook or scrapbook for his personal works, art that look like they were created spontaneously. There are lots of sketches, doodles, colour pencil works, comic panel drafts, paintings and other art experiments. By art experiments, I mean he would draw on leather, there are pieces with surface finishing that resemble granite textures, and then there's the cover art (the sides) that you can't tell that is created from something that could actually be soil. Sam Kieth also talks about his work. The book starts off with a rather weird introduction by an alter-ego created by Sam Keith. Thankfully, the rest are first-person commentary. There are quite a lot of photos of the artworks taken with a camera. Those can be quite disorientating to look at because the artworks are meant to be view flat on. Some of those artworks are quite impossible to scan because of the media that's used to create them. The book description says the content are mainly entirely new pieces of art. Well, this is a book for Sam Kieth fans. It's hard for me to describe the style except to say that you'll probably want to flip through before buying. The book has 256 pages, hardcover. It's another good artist-centric artbook from IDW Publishing.